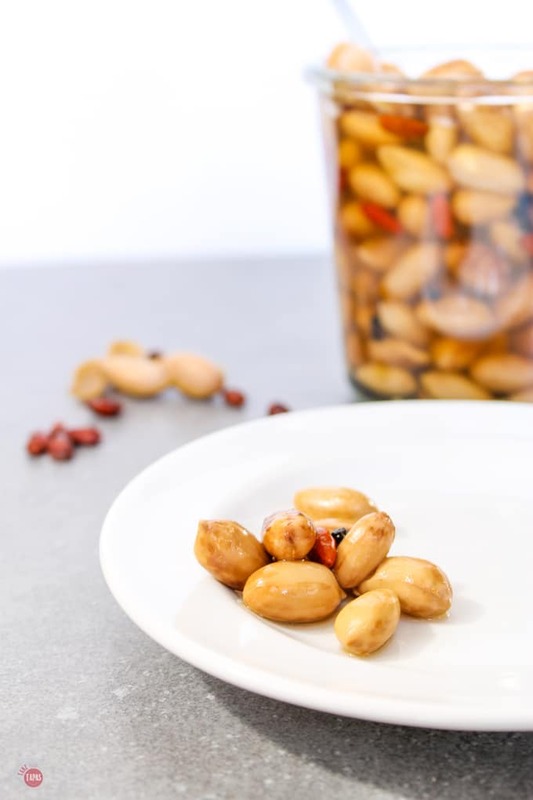 These pickled boiled peanuts are elevated from regular boiled peanuts with pickling spices and make a great snack or topping for your Pad Thai! Winter is in full swing in South Georgia! Northerners are saying “Boo-Hoo” with an extremely sarcastic voice right now, but it is much colder than us “Southerners” are used to. During the winter months, “Southerners” eat the fruits of our Autumn harvest, usually from Mason jars because they have been “canned” or pickled to store them for later consumption. I had my first “canning” experience a few summers ago when Brooks showed up from a trip to Atlanta with a bushel and a half of fresh tomatoes that he picked up from a farmer’s market. I was so excited because they smelled and tasted like they were just picked from the vine! I wanted to preserve that summer flavor so I called my mother in law and we had a “canning” party! We enjoyed those beautifully preserved tomatoes for over a year and they tasted as fresh as the day they showed up at the house. I have just recently been drawn into the pickling trend when my friend Chrissy made those amazing Pickled Red Onions for me. Even though peanut season is over for a while, peanuts are harvested in September and October, I still crave boiled peanuts. My brother-in-law makes some fabulous boiled peanuts when he gets the chance and my oldest son, Braxton, eats them by the bag full. Thanks to canning you can get boiled peanuts year-round at the grocery store. I also found some in my produce section in a microwave bag already prepped and ready to go. 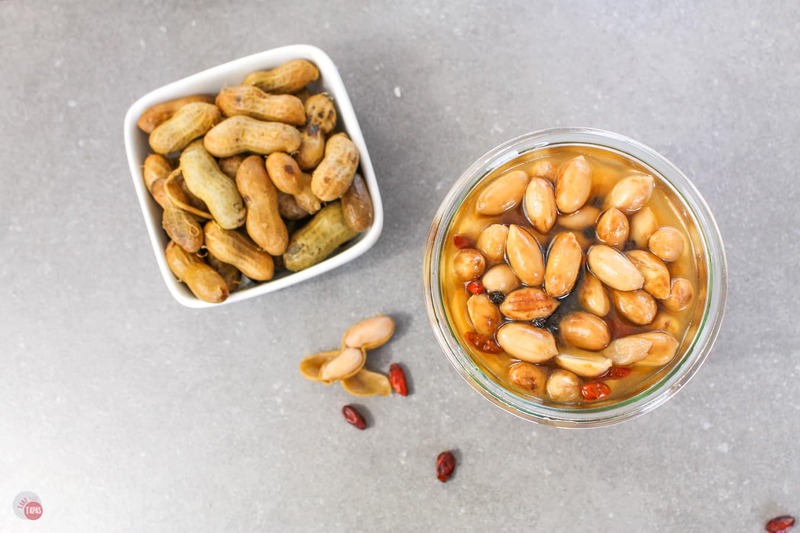 Maybe we can pickle some and make them pickled boiled peanuts… What a cool new snack! For this recipe, I used the bagged ones I found in the produce section. They come in a 2-pound bag so that works out perfect for the recipe. If you don’t have these available, there are some great canned varieties available all year round! While I was catching up on a few of my 327 DVR’d TV shows, I sat and shelled the bag. The pickling process for the pickled boiled peanuts is quick so the longest part is the shelling. This might be an “all hands on deck” situation that you can call family bonding if you are so inclined. Once the peanuts are shelled, get your pickling liquid going. Put the peanuts in your storage containers along with your spices and make sure to leave some space for the liquid. I used dried peppers, peppercorns, and garlic for this basic recipe but feel free to add anything else you might want such as bay leaves or other spices. 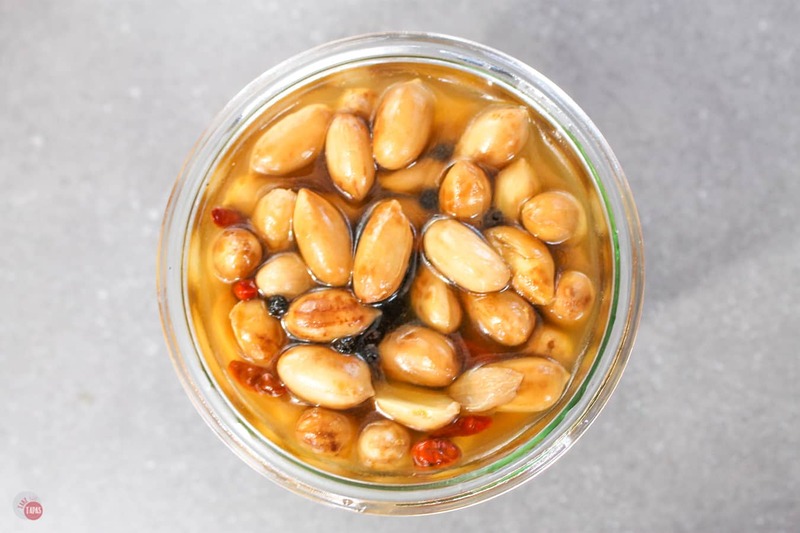 When the pickling liquid comes to a boil, pour CAREFULLY over the peanuts until covered. Let cool and cover your jars. These pint-sized jars are great to keep these pickled boiled peanuts in and also give some to your friends. Store in the refrigerator for up to two weeks. 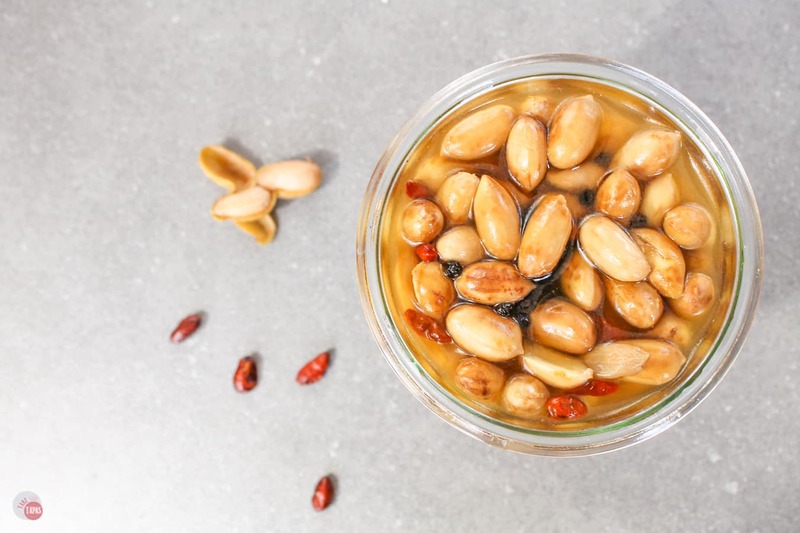 If you want to store longer, you will need to perform the traditional canning procedure of boiling the covered jars to eliminate bacteria and create the vacuum. These make a great snack, add to your cheese tray or a new twist on your Pad Thai! Who would ever think to use pickled boiled peanuts in Pad Thai? 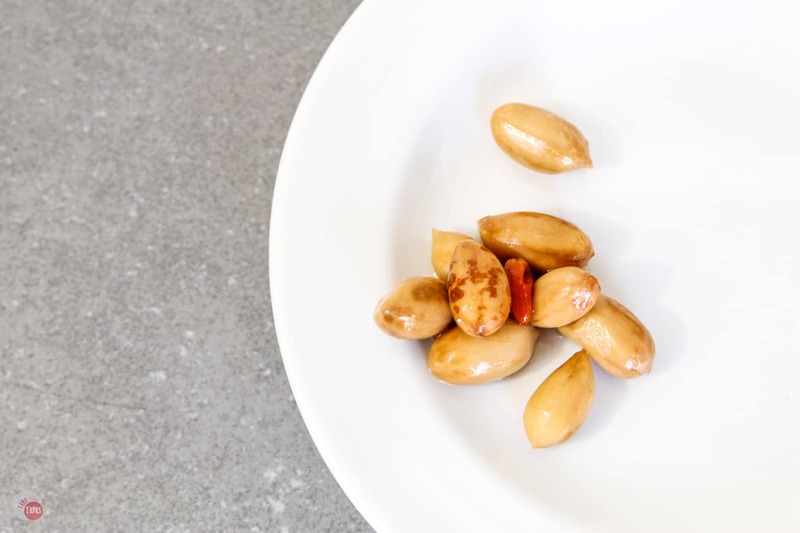 These boiled peanuts are elevated with pickling spices and make a great snack or topping for your Pad Thai! In a medium saucepan bring the vinegar and spices to a boil over medium heat. 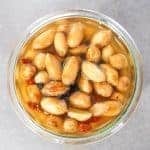 While the liquid is heating up, pack your jars with the peanuts and any additional spices you might want to add. When the liquid comes to a boil, carefully pour the liquid into the jars and leave a 1/2 inch of headspace. Let jars cool, cover, and store in the refrigerator for up to two weeks. If storing for a longer period, process with traditional canning procedures. If you were to can these, would you use a pressure cooker or water bath and for how long would you cook them for? I would use a water bath and process them for 30 minutes. I hope you like them!! I love boiled peanuts. These look absolutely incredible and I can’t wait to try them. We will love your Pickled Boiled Peanuts! Thanks so much for sharing with us at Full Plate Thursday. Have a great week and come back soon! I guess I know nothing about peanuts. You boil them first? Then shell them and put them in the pickling liquid? I’m still learning! Thanks for sharing at What’d You Do This Weekend? Hope to see you again next week! Down in south Georgia people take their boiled peanuts very seriously. Spices in the boiling liquid and for just the right time. Once they are boiled (you can purchase already boiled) then you shell them and pickle them. So yummy! Sounds very interesting. I love boiled peanuts but have never had them pickled. I might have to give this a whirl when I boil some more peanuts. Thanks! Thanks so much! I fell in love with them, and just about anything pickled, so I know you will too. They make great hiking snacks! 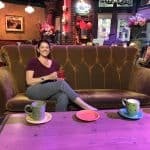 Another food blogger from South Georgia – I love it! I’m from Tifton, though these days I live in Maryland. I absolutely love boiled peanuts, but I’ve never had them pickled. Can’t wait to try it. Thanks Laura! They are always on my cheese trays now and my friends ask for them for gifts! When I lived in Alabama and Georgia, I would always see signs on the side of the road for people selling boiled peanuts. Coming from the midwest I’d never heard of it before. I’ll have to give these a shot since I never made time to stop off at any of the side of the road shops. Pickled Boiled Peanuts?! Are you nuts? j/k 🙂 I’ve had pickled onions before so I bet this would taste pretty yummy. I love boiled peanuts and pickled onions! I thought, why not?!? I eat them for a snack or I throw them in my salads for a little surprise! Thanks for stopping by! Wow I have never heard of this! I think my hubby would really love it. Can’t wait to try it. Thanks! Let me know how he likes them! I am in Georgia as well, and this winter is NOT fun–and that is coming from a Northern transplant! I have yet to try boiled peanuts, but the pickling may convince me!